This page contains detailed policy information about making your reservations, paying for your trip, paying your deckhand. HOW POOR CELLULAR RECEPTION CAN EFFECT YOUR RESERVATION REQUEST – Often anglers submit reservations requests via their smart phone or tablet. Because the smart phone may not have good reception or strong internet connection, this can cause their reservation request to appear that it is not going through or is being submitted. Do yourself a favor and fill out request on a regular computer or wait until you are where your smart phone has a good signal or strong wifi connection. IMPORTANT RESERVATION INFO – If you submit a reservation request and do not get a response from me within a couple of hours, you can send me a text message at 251 975 8111. You may also need to check your spam folder. I do respond quickly to every request I receive. Remember, YOUR TRIP IS NOT BOOKED UNTIL I REPLY AND SAY ” I HAVE YOU CONFIRMED. I go to bed early at night, so reservations submitted after 9 pm, may not get read until 5 am the following morning. OUR RESERVATION FORM – The first thing we ask you to do is fill out a reservation request form in its entirety (with credit card info if you are serious about wanting to go with us) and submit it. By entering a credit card tells us that you are very serious about going and if we have that date(s) available, you will likely confirm your trip, when asked by us if you want too. Using a desk top or a lap top works best. As mentioned above, Cell phones connections and poor internet speeds are often slow and sometimes slow down reservations requests. We need basic information about you and your group so we can begin custom tailoring a trip just for you. We will immediately see if we have the date available and will respond quickly via email because sometimes we are offshore and can’t get a signal. Be sure to check your email at least hourly after your reservation submission, because we answer them quickly. Only exception is after 9 pm at night until 5 am while I am sleeping. If you have not heard from me within a couple of hours during the daytime hours, please send a text message to me, that way I will look for it. This way, you get first shot at the date you want. Important – If you will be in town all week and can fish any date, please let us know in the comments section. This way, if the date you want is not available, we can see where else we may have an opening and offer it to you. NO DEPOSIT REQUIRED – We are the first charter fishing company that does not require a 50% non refundable up front deposit to hold your trip. Like a hotel, all we require is a credit card to be on file to hold your reservation. By submitting your credit card information via our secure server with your reservation request, gives you priority for the date requested as long as it is not already booked. We look for 1 person to pay for the entire trip. If you are sharing the expense with others, please combine your money beforehand and let me deal with one person for payment. This saves time and we don’t have a lot of it during the busy fishing season. When do you pay for your trip? It is important for you to bring your form of payment (cash or credit card) with you to the boat on the day of your trip. We only accept US Currency, All Major Credit Cards. No Checks or Travelers Checks accepted. Make sure your credit card company knows you are out of town and spending money on a big ticket item. Paying for trip using a credit card: There is a $25 credit card processing fee that is charged in addition to the cost of the trip. As mentioned above, your deckhand has a minimum $250-$275 cash fee for 6 hour trips for 4 passengers and up to 6 passengers maximum. However, if he does a really good job for you, you are welcome to tip him anything above his minimum fee. Why The Mate Gets 20% Minimum – We are not like other charters. We offer a premium service that can’t be found elsewhere. Your mate works very hard for you while you are on board our vessel. Just like a waiter with a large table, he has a minimum fee for his services. We ask you be prepared to Pay him in cash at the end of the trip and after he has cleaned your fish (if they are in season). For that rate, you get a clean boat, well maintained fishing gear, excellent customer service and he will clean and bag the fish you catch for free. Remember-Other charters charge .30 cents per pound to clean your fish and they don’t even have scales to weigh your fish. We just make it easy and offer complimentary fish cleaning as part of the deckhands fee. If you have had a good time and really enjoyed your captain’s company and service, you are welcome to tip the captain at your discretion. When paying for your trip on credit card, the computer screen where you sign your credit card, there will be an option to choose the percentage of tip you would like to give the captain. IMPORTANT INFO THAT OTHERS IN YOUR GROUP SHOULD KNOW- Normally, the person making the reservation is the one who is paying for the trip and knows everything about what to expect. Sometimes, they invite others to come along and let them cover the deckhand fee. If someone in your group, other than the person making the reservation is in charge of taking care of the mates fee and tip, please inform them on what the fee should be, and that cash is the preferred method of payment. That way the mate can take care of his family and he doesn’t have to wait on me to pay him. He is an independent contractor who works with the Distraction and the only money he makes is from you. We care if you have a good fishing experience and do all we can to educate you on what we can and cannot deliver. 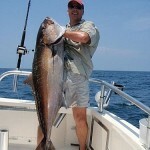 It is important for you to explain to YOUR family and friends about what to expect out of this fishing trip. We get a lot of people who invite others in their family or friends to come along and upon arrival, their expectations about catching and killing a bunch of fish are way higher than we can deliver due to short federal seasons and bag limits on the most popular reef fish species. We don’t mind anyone harvesting as many fish as they can, as long as they are in season. We will let you catch as many as you like out of season but they will have to be released. It is up to you to explain to your guests, what we are all about, so they are not in shock when I tell them that “because of seasons being closed on certain species,” we might not be bringing many or any fish back to the dock. As fishermen, we can’t control what fish are in season, the way they bite or the weather and sea conditions. All we can do is give you an honest effort to put you on the fish and let you catch them. Weather Policy – We do not plan on taking you out in unsafe weather or rough seas. Normal conditions to us, are sunshine, rain, thundershowers and seas less than 4 feet. Even though the seas might be a little wavy and uncomfortable for some, it still may be very safe to fish. Therefore, we will not take you on days when we would be miserable ourselves. If it is raining the morning of your trip, you need to show up on time. If there is an issue, I will be calling, texting or getting in touch with you beforehand. Customers Checking Weather in Advance– With the advance of smart phones, we are now seeing a trend where more people are booking trips around the rain forecast way to far in advance. From April to September, there is a 50% chance of rain almost every day here on the gulf coast. Don’t worry about that. We don’t use the same weather forecast you do. We use a sea forecast. It shows us sea conditions and wave height for about 1 week out. The bad thing is, meteorologist miss the forecast half of the time and we are able to go. Being a commercial pilot also, trust me – I watch the weather every day and promise not to take you in rough seas. We want you to have a good experience and promise to do the right thing for you. Captain Canceling Trips – We do not cancel trips until the day of the trip because the weather man has been known to miss the forecast. You must show up at the boat even if it’s raining, windy or lightening as these storms usually pass quickly during the summer months. Unless you hear from me via phone, text or email, you will need to be at the marina and be ready to go. It is extremely important for me to have your cell phone number and communicate with me if the weather is questionable. If it’s going to be bad or is already bad weather and it does not look like it’s going to calm down, I don’t mind canceling myself. I don’t like being out in rough seas anyway. While At Sea Captain Cancellation Policy – If for some reason we are offshore fishing and sea conditions become rough enough to where the captain makes the call and starts headed back in, you will only be charged for the amount of time you were on the boat. The rate is $210 per trip hour. If we are at sea a good distance, the captain reserves the right to add an additional fee of $100 to offset the fuel burned if we have to come back home. If you are on a six hour trip and we have to cut it short and get in within four hours, you will only be charged for that time. Sound fair? 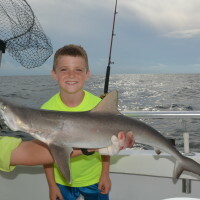 At Sea Customer Cancellation Policy – If for some reason we are offshore fishing and you, some or all of your family members want to head back in because you want to cut it short, that is OK with us. You are on a private charter and you are in control and if you want to go back, consider it done. However, if sea conditions are safe and fish-able, unlike the captain cancelling the trip mentioned above, you will be expected to pay for the entire agreed upon time plus the mates fee. Customer Cancelling a Trip Before Your Trip Date – If for some reason you decide not to go fishing for whatever reason, and you are 14 days or greater away from the date of your trip, you may do at no cost. If you want to cancel within the 14 day period, we will try and book the trip with someone else. If we are unable to book that date after you cancel, we reserve the right to charge your card for the full amount of the charter and the deckhand fee. We do understand that things happen to families, but we are a for hire business and we could have booked that trip with someone who does not cancel in short notice. We are not the airlines that only sell one seat on a plane that is going anyway. We sell a premium activity and time slot. Canceling your trip in short notice makes it hard to find someone to take your place. Please be courteous and give us as much notice as you can if you decide not to use our services or want to cancel your trip. Equipment Damage or Loss – You are responsible for loss or damage you do to equipment that belongs to the boat and must replace in kind at market value determined by the Captain/Owner. You are also responsible for any damages you or your party may do to the boat, seat cushions, etc. If a piece of our equipment malfunctions, or exhausts itself due to circumstances beyond our control, you are not responsible for that. Remember, leave pocket knives with clips on them at home or stow them away so they won’t cut our seats. Fish Catch Guarantee – With fishing, there are NO Guarantees concerning the number of fish or the species you will catch or will be able to keep. We take you to Experience Fishing® and we will do all we can to put you on the fish. The regulations change almost daily and because of the what may be in season may change suddenly, we can only promise to take you to have fun and you might not be able to harvest any fish. 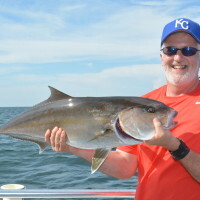 Privacy/Copyright / Photos / Release – Captain Troy is a professional guide, outdoor writer and photographer. We take photos of you and your family during your trip and give you a copy of them to enjoy and use. Captain Troy reserves artists rights and owns the photos that are given to you. We use these photos by publishing, posting and have the right to sell, trade or use in any way we choose. When you confirm your charter, you are acknowledging that you understand that these photos are yours to use any way you like, but we reserve the right to use them any way we like. We do not use photos in any way that would violate public safety or tag you or your kids by using your names on social media. Videos – We have two video and security cameras located on our boat. One videos the rear deck while you are fishing and there is only one copy of that action and it is given to you so you can watch yourself fishing. 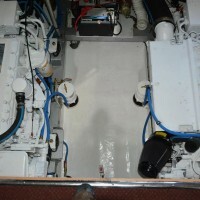 The other camera is located in the main cabin in the forward area, looking backward toward the seating area and rear of the boat. There are no other cameras located in this boat. Your privacy is important to us and that is why we want you to know how much we value your business. 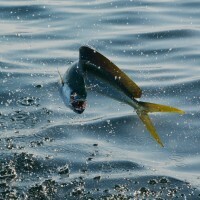 Disclaimer – Fishing is not an exact science and does not come without risk. There are hazards involved with fishing. There are moving waves, rocking boats, fish hooks, leads, doors that open and shut and obviously there are fish that can bite you, fin you, poke you, poop on you or have scales that can slice you. We do all we can to protect you, but your participation is VOLUNTARY and assume all risks involved. When you book a trip with us, it is implied that you understand the risks involved.